A couple of weeks ago, I saw that I was mentioned in Twitter, alongside a link. Upon visiting the URL, I discovered to see… well… myself! My immediate and initial reaction was that of confusion. Then, after I understood what I was looking at, I was surprised at how realistic and accurate the illustration of me was. 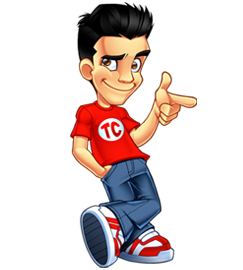 The illustrated version of my logo, which I did not commission (or even know about in any capacity), is the work of Stéphane Kerwer, an online marketer who runs Dukeo.com. In addition to the illustrated version of my mascot, it is accompanied by a summary of my online experiences in a post titled Who is Tyler Cruz? Most of it appears to be regurgitated from my About Page, which reinforces the notion that I really need to update that soon as it’s already getting quite dated again (it’s nearly 3 years out of date). And more recently, Missy Ward and Ian Fernando have been added as #12 and #13. The “Dukeo List” is starting to become a “who’s who” list of online marketers and entrepreneurs. If you’ve made it on the list, you know you’ve made it. Okay, well maybe not to that degree, but it’s sure a good company of people to be associated with. After doing a bit of digging, I discovered that it was not actually Stéphane himself who did the illustrations. Rather, he commissioned an artist for them. Coupled with the strong watermark, this only increases the likelihood that this is all being done for link bait, which is obviously working since I’m doing this very post. Even if Stéphane denies it, I have no problem with this link bait. Any positive link bait is fine in my book. Plus, it’s a good example of how you can help ignite your blog by thinking a bit out of the box. I don’t know how much he is paying his illustrator, but I bet it’s less than the $275 it would cost for a paid review on my blog. The only thing I’m not too crazy about is the watermark over the illustration of ME which is completely based on my standing avatar which is my intellectual property, and the fact that I had to ask permission before being able to post it. I’m not 100% sure about the legalities of this, but I would think that others cannot directly profit off of another’s branding. But it’s not a big deal, and that’s the only small negative thing I have with this particular method of link baiting marketing. So, who will be next on the list? Will it be you? Stéphane is really getting a lot of attention from these caricatures. They are awesome and I can see why so many people are talking about them. I contacted him a few weeks ago about getting one done, but the only way he’ll do it (or have his guy do it) is to pay for a “Who is” post (or get one for free like you). It works because the illustrations are of extremely high quality. If they were just of decent, moderate quality, I don’t think this would work at all marketing-wise. Nice work by Kerwer. Pictures are looking cool due to their high quality. Triple win! You, dukeo and the artist are all getting great publicity out of this! Very nice caricatures, just look exactly just like their pictures. Hey Tyler. I have been reading your blog for years and check it out in reader everyday. I was wondering if i can make a request. Can you tell us what your typical day is like these days? That TC overview is truly impressive! And your red shirt is unforgettable :)! Stéphane Kerwer have that unique creativity that makes it noticeable by the bloggers. I read about a post about her just last week ago from a top internet marketing entrepreneur as well. He was amazed how dukeo.com is well known for making caricatures for the top internet marketing gurus, which increases its subscribers and traffic. I hope when he does my caricature that he uses the best pic and it looks great! That is a neat out of the box way of thinking but I am with you on how legal it all is. With the images being in the likeness of branded material I don’t think that is really cool of him to do. While it is working and the characters are of high quality, I wonder what Shoe had to say about it. He isn’t one to let things like that roll. These are really, really good! I think you should hire her to redesign your header on this site, ha! I disagree with you on one point, it works because its a unique and new idea, even if the illustrations were mediocre, it would still work. Also it appeals to people’s vanity, which is like gold. That’s cool the artist is certainly talented! That artist is very talented.I agree with Web Solutions.How does he do it?Well anyways I bet he is getting tons of views on his website with all these famous online affiliate blogs blogging about him. Wow, you look so handsome, Tyler! That is a very cool illustration. All of them are of very high quality from what I can tell. 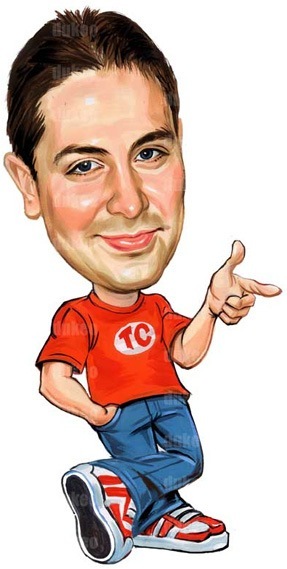 Good stuff… i didnt know you had a caricature…i guess i forgot the webinar you did with john chow as of late. I really like that one. Reminds me very much of the caricatures done through the years in MAD magazine, which had, in my opinion, some of the best comic artwork there ever was. The designer is cool and awesome! I’ve seen many mascot designer but this mascot really look exactly like you, and other mascots too! I don’t think so, I believe that he only does it for some big guys on the web like you Tyler, I think he is trying to be well known and get those mascot owners to blog about him (like what you did), there he gets exposure FREE! Awesome callicatures, this guy, who makes them, must be very talented! I wished he could make me as a callicature! This is something I have never seen before. A really creative way to get traffic and exposure. Smart marketing. Stephane really did an amazing job with the caricatures. I did check out the legalities that Dukko posted and they are quite interesting. I never would have thought. 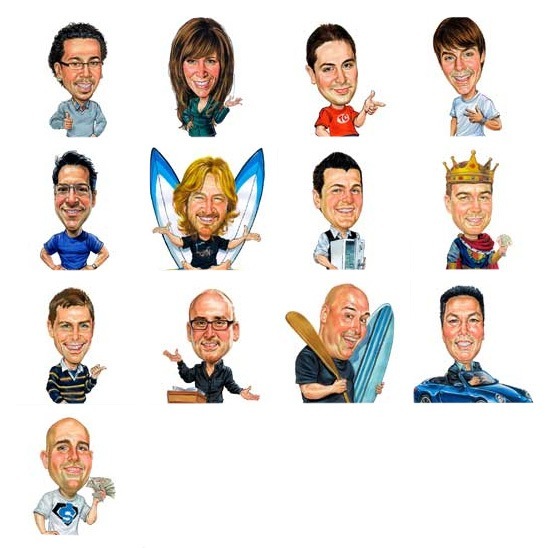 These caricatures are awesome. I love Darren’s. Loving your red TC t-shirt. I’ve never seen this site before, thanks for sharing Dukeo it has some really interesting content as well as, some cool versions of the mascots! Lol…all of them..they look great! That’s pretty creative on his part to start these drawings, I wonder what he will think of next to attract links. Perhaps animated caricatures next? That would certainly look good at the top of the site banner if done properly. Cartoons = smart SEO? Absolutely, most every blog will readily link to one of them and getting one link from a related blog is rewarded by Google. Wish I could doodle like her!